« Why On Earth Was Poland Still Flying The Tupolev Tu-154 Airplane? 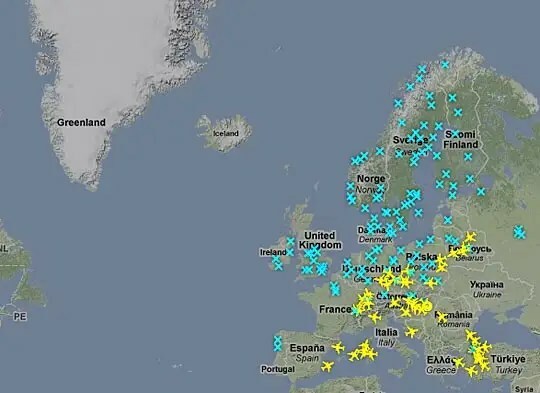 While it is early in the morning in Europe the following picture shows the impact of the volcano in Iceland on European air traffic (as of Thursday), if you compare Northern (none) and Southern (60) European flights. The blue crosses are airports. The volcano has already had a stunning impact on Europe, although articles about it are already dropping below the lead headlines. There is a thought that the plume may last another five days, and even though the cloud is largely invisible to those who are being impacted by it, the damage by neglecting these precautions could be severe. And given that the British election is on May 6th, the impact of a sustained eruption on the debates in the UK, and the result may go beyond just limiting the travel of those who would campaign, to become more dominant with the length of the flight curtailments and the responses to help resolve what are likely to be growing transportation problems. WITH ACUTE EXPOSURE, 5 PPM CAUSES DRYNESS OF NOSE & THROAT AND A MEASUREABLE INCR IN RESISTANCE TO BRONCHIAL AIR FLOW; 6 TO 8 PPM CAUSES A DECR IN TIDAL RESP VOLUME. SNEEZING, COUGH & EYE IRRITATION OCCUR AT 10 PPM; 20 PPM CAUSED BRONCHOSPASM; 50 PPM CAUSES EXTREME DISCOMFORT BUT NO INJURY IN LESS THAN A 30-MIN EXPOSURE … 1000 PPM CAUSES DEATH IN FROM 10 MIN TO SEVERAL HR BY RESP DEPRESSION. 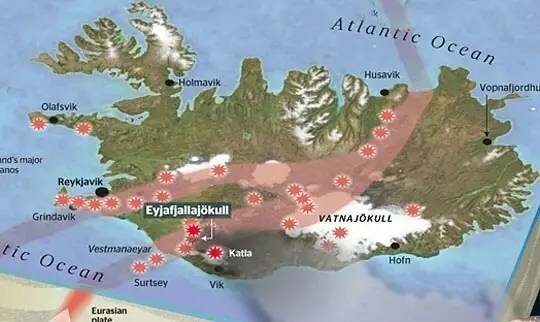 The larger eruptions of Katla, have ejected up to 1.5 x 10^9 cu m of material with a Volcanic Explosivity Index (VEI) of up to 5. For comparison Mt Pinatubo in 1991 ejected 1.1 x 10^10 cu m with a VEI of 6. The Times has an interesting graphic that shows some of the concerns and I am going to use a bit of it to show that the problem may be a little bigger than even the article suggests. To begin with recognize that Iceland is at the intersection of different plates that together form the shell of the planet. Whereas in some parts of the world these plates are pushing together and riding over each other, in this part of the world they are tending more to separate, so that the magma, on which the plates ride, can make its way up along the joint planes and erupt at the surface. Iceland’s Laki volcano erupted in 1783, freeing gases that turned into smog. 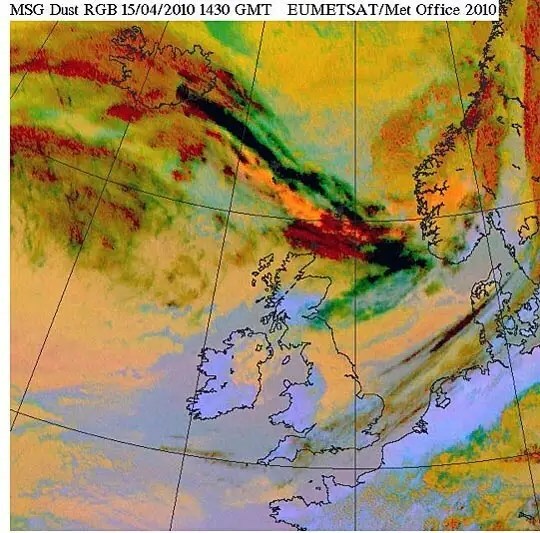 The smog floated across the Jet Stream, changing weather patterns. Many died from gas poisoning in the British Isles. Crop production fell in western Europe. Famine spread. . . . . . .
And the consequent distribution at different levels of the atmosphere. The agriculture of Europe would be damaged by a prolonged eruption with this distribution, and with it the possible production of biodiesel. 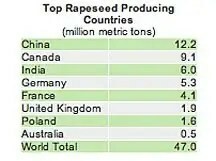 Consider that the growth of rapeseed (canola) around the world has been steadily rising over the past few years. With European countries sitting just behind the leaders. Somewhere over 4 million metric tons of the crop currently goes to producing biodiesel, mainly in Europe. (Heading up towards 100,000 bd). Losing a year of that crop (and large scale volcanic activity can have an impact for over four years on the climate and the ground chemistry), particularly given the current possible approach of the peaking of conventional oil production, could have an unanticipated impact on overall liquid fuel availability and price. Unfortunately rapeseed is only one of the crops that will be affected, and the significant drop in crop yields does not appear to be getting much attention yet. Wind wing tip speeds have been projected to be in the range from 264 ft/sec to 326 ft/sec. At impact speeds over 120 ft/sec the particles from the eruption will start to erode the blades of the turbine. 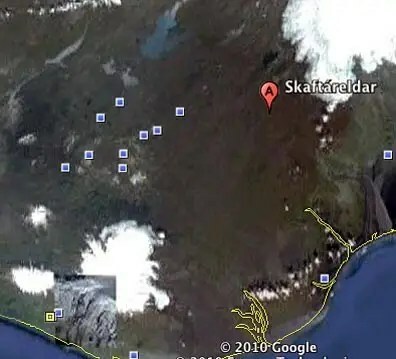 If the eruption continues for weeks, and the turbines rotate in that atmosphere (which looks clear to normal vision) then they will lose surface quality, and perhaps the particles will enter into the generators (as they do on aircraft) doing significant damage. 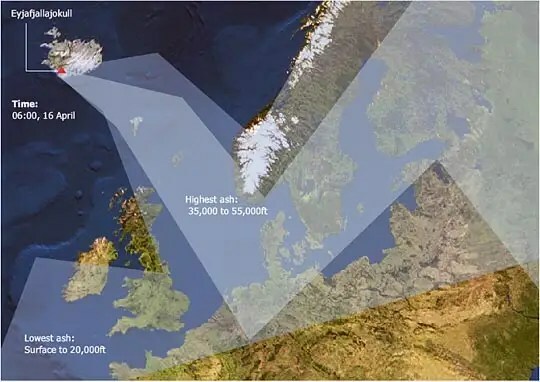 Thus, beyond the initial inconvenience of the loss of a way to fly (bearing in mind I am supposed to fly to Europe myself soon), there are the longer concerns over both the crops this summer and for the next four, and for the longer term health of the turbines. All in all it is a reminder that there is never a time that Nature, with a little nudge, cannot remind us of the risks of complacency. This entry was posted on April 20, 2010 at 8:40 AM	and is filed under Press Releases. Tagged: Airline Industry, cloud, disruption, Eyjafjallajökull, iceland, Oil, Volcano. You can follow any responses to this entry through the RSS 2.0 feed. Both comments and pings are currently closed.